Lesson learned... Don't shear too early. At the end of March 2007 the temp. in our part of WV was 74°. 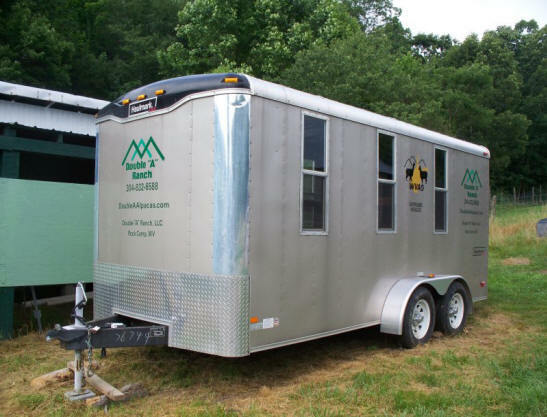 We head to FL in our customized livestock trailer to pick up our animals, determined to treat them royally with every comfort. In FL we learn that we can have them sheared before the move. So naturally we thought that would be a great idea. April 1st we reach WV to find the temperature is dropping, and dropping some more. By the next day it was a freezing 19° We did everything we could to heat our large barn. Since we had taken their coats we decided to give them ours! Here is a brief video of Damien and Mr. Chip neck wrestling, this is about as "vicious" as it gets. Notice our guardian dog, Memphis, has had enough of the rough house in what she considers her pasture. 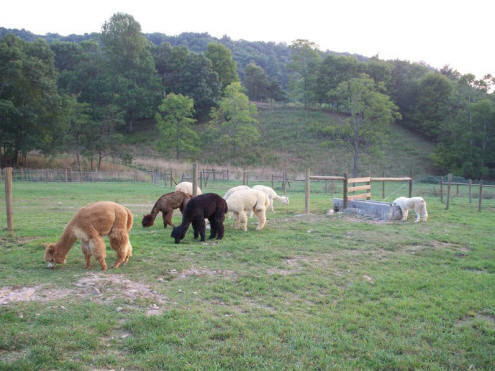 Living with alpacas is both relaxing and exciting. Their daily activities provide an evolving insight into their social interaction. They are herd animals and live and function as a group, but within that group, which at first may seem to be homogeneous, emerge many different and diversified characters and personalities. There is a hierarchy which includes the dominant animals, the mothers’ group, and the youngsters, all easily discernible as they execute their respective roles. Young ones spend a lot of time with their mothers but they also find time to play, running and chasing each other. Their run usually starts with a hop or sideways skip before they break into a breakneck helter skelter. They seldom run in straight lines, instead they zig-zag, bouncing like gazelle, and, at times, seeming to float over the ground, so elegant and effortless are their strides. Then they play neck wrestling; each trying to press down the neck of the one they are playing with. This can go on for an hour or more and in the summer evenings there is nothing more restful or entertaining than watching the early evening capers of the herd as the younger members run and play their games of catch and take-down. Early each morning we feed them their grain and mineral supplements; each has his or her own bowl set down. In this way we monitor how much each animal receives. Nursing mothers, heavily pregnant mothers, and breeding herdsires get extra rations. As we open up the storage stall and begin to fill the bowls, we are besieged by a pressing mass of alpacas, each attempting to ensure that they don’t miss out on the ‘goodies’. The center aisle of the barn fills with animals that press forward making it difficult to squeeze through them as we take the bowls outside. We could, of course, stop this from happening, but we find it so much a part of what the animals are all about that we love it. The following are videos of Snoball giving birth to Mr. Chip's Angela Rose (Rose). This is the first birth at our ranch and we were blessed that I was there with the camera for the event and happened to be in the pasture from the start. 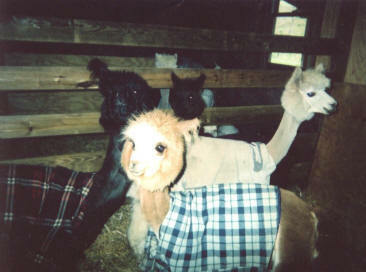 We googled many times looking for an alpaca birth video so that we would know what to expect but didn't find any. In sharing this we hope it helps prepare others who also may be nervous about the big event. Please excuse the shaky hand on the first video, it took me a bit to calm down. Allen was out of town and I was alone counting on Snoball's experience. The cria, Rose, was born on July 18, 2008 at about 10:30 at a healthy 17.5 lbs. There are several short video segments and it might take a few days for me to get them all up. on our Photos page there are pictures of Rose taken that afternoon. We hope you find these videos informative and useful.